Sunday was our last day. We finished packing, and left our suitcases in the very efficient left luggage facility at the hotel check-in area. We booked a shuttle bus to the airport ($7 each). And caught the SDX back to the mall where R treated himself to a watch he’d fancied for some time.The shuttle bus took about 25 mins to get to the airport, as it was picking up passengers at a number of hotels, and also dropping off at some of the other terminals. Terminal 3 seemed to be quite a distance away from 1 and 2, but when we arrived Virgin were doing curbside check-ins, which was a novelty for us (though the check-in girl said she’d rather be inside the air-conditioned terminal building.) Our bags were just under the 25kg limit, and they’d go straight through to Dublin. That was a great relief! I usually have to keep toiletry bags of sun cream, lotions, toothpaste etc near the top of my case ready to ditch if my bag is overweight. The airport terminal was quite small, though it did have a gambling room. We found a bar, selling very overpriced drinks. A man beside me asked the price of a beer, and on hearing the price asked how much a small one would be. Even that was outside his budget, and when he enquired if there was ANYTHING that he could get for his $8, the answer was no. I did offer him my last cash dollar, but he refused. I stocked up on US sweets and peanut butter crackers in the shop, and salt water taffy for my office colleagues.We boarded on time, but then sat on the runway for well over an hour – apparently the baggage checking computer system had gone down, and the numbers of bags and passengers didn’t match. Our seats weren’t great. We were right beside the galley, and as this was a night time flight we’d be trying to get some sleep, but the noise and lights emanating from there made this more difficult. Worse, when the food trolley emerged it went to the back of the plane first, and by the time it reached us not all choices were available, and those that were tasted very overdone. We dozed on and off throughout the very short night, and landed about lunchtime in Gatwick. As we had a long time before our next flight, I’d booked a room in the Yotel, situated in the terminal building and renting small cubicles by the hour. These contain a bed, a shower and loo, and a TV, and are perfect for chilling out and getting some much needed sleep before the next leg. There are plenty of food options nearby including Marks and Spencers Simply Food, and we emerged 4 hours later feeling rested and refreshed. The final leg to Dublin, picking up the car, and driving home, all went according to plan, though we were shattered by the time we stumbled over the accumulated post behind the front door. The journey is long. If I was going to the States again I’d pay extra to fly direct from an Irish airport, where you can do the immigration process before you depart. 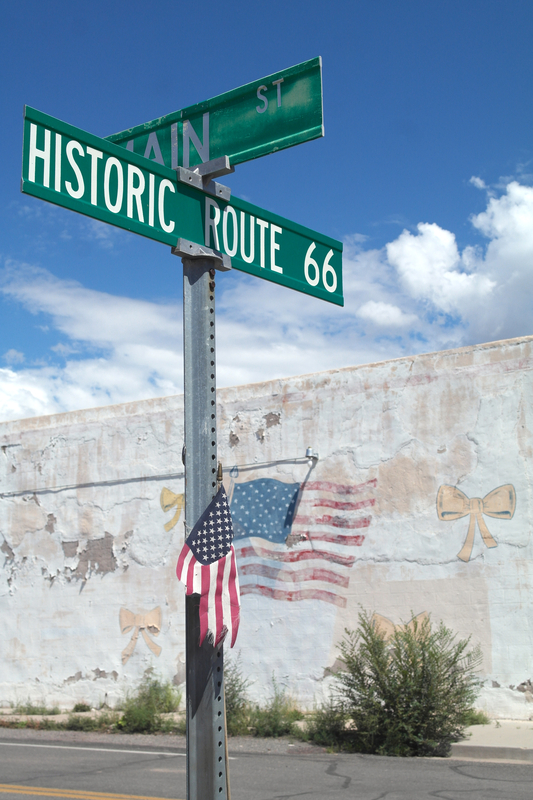 I’d love to see more of Route 66, and take it at a slower pace. Vegas is flashy, trashy, brashy, cashy. There is no such thing as bad taste, or too much bling. 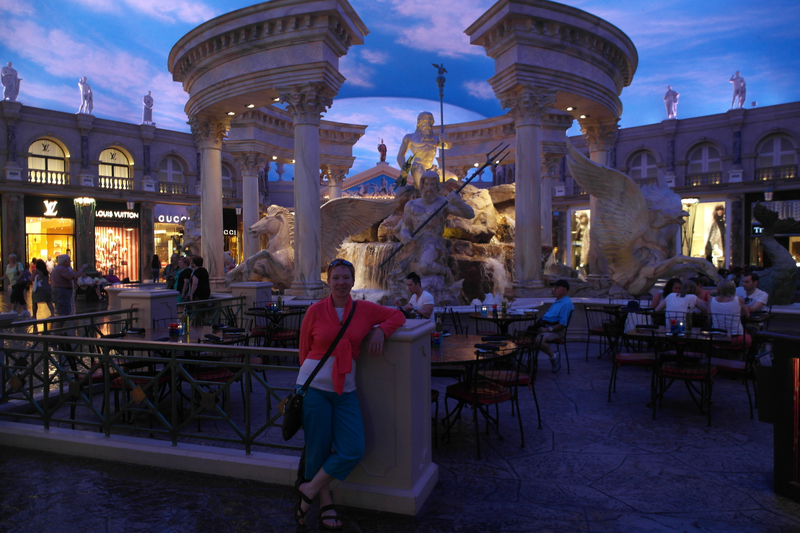 Are the ersatz Venetian canals et al even better than the real thing? Anything goes. No really, I do mean ANYTHING. 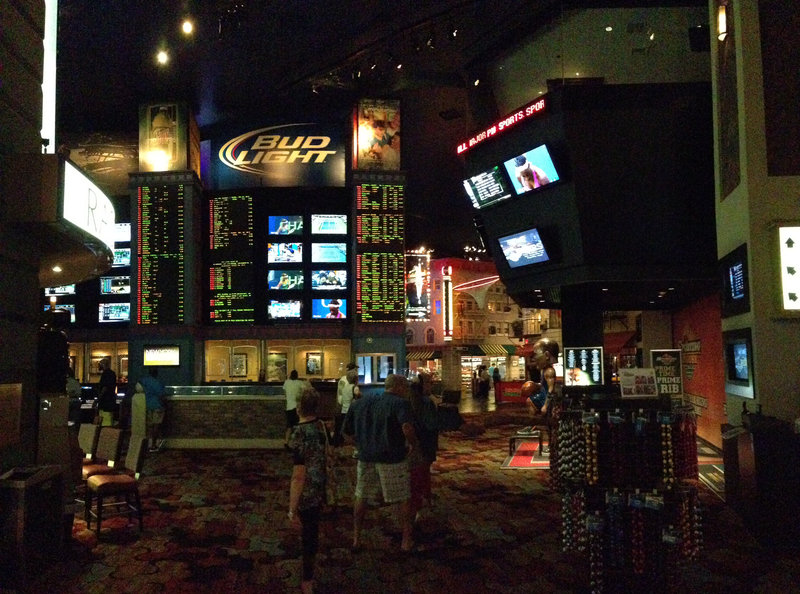 It’s a full-on top-speed no-holds-barred sensory overload. What happens in Vegas, stays on facebook …..
I’ve been ParkRunning for most of this year now – did my 24th today, in fact! My Personal Best time (PB) had been 28:16, which I’d recorded back in June, when I was in serious training for the Lisburn half-marathon. But ever since then my times had got worse. So in an attempt to stem this downward tide, I joined Jog Lisburn. These fabulous folk were following the Couch to 5K programme, as the vast majority of them were getting ready for their first ever 5k run. Training was 2 nights a week, rain or shine, and even on dark nights we found routes in Wallace Park which still had some illumination. That, coupled with ensuring I didn’t overdo the booze on a Friday night, brought about some improvement. And I knew I was fast last week, but it wasn’t until the official results were published that I discovered I’d only been ONE second off my PB. One miserable second!!! This annoyed me. I started trying to work out how I could monitor my speed and pace while I was actually running. Could I create a playlist that lasted 7 minutes per lap, maybe? I wasn’t keen on a watch type device – I already run with a dog which occupies one hand. So I explored what functionality there might be on MapMyRun. And I found Voice Feedback. 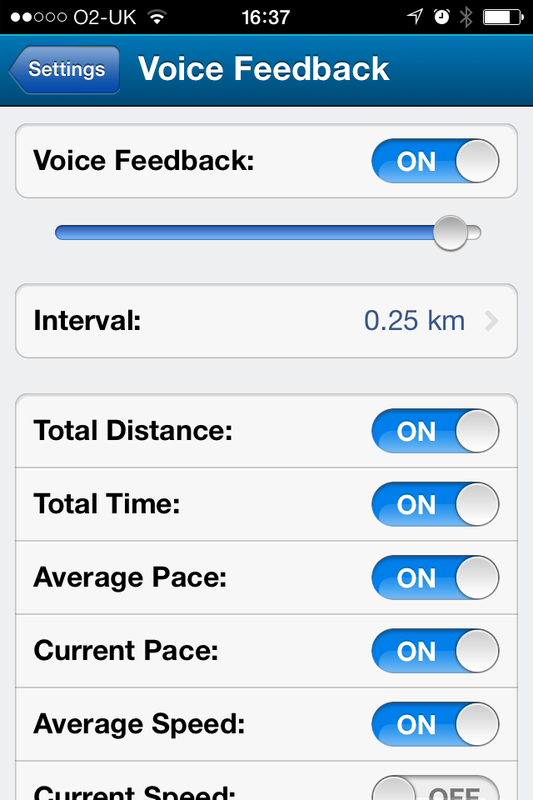 I set it to report every 0.25km, and tell me total time, average pace, average speed, and current pace. I tried it out walking the dogs, and again at Wednesday night’s training. 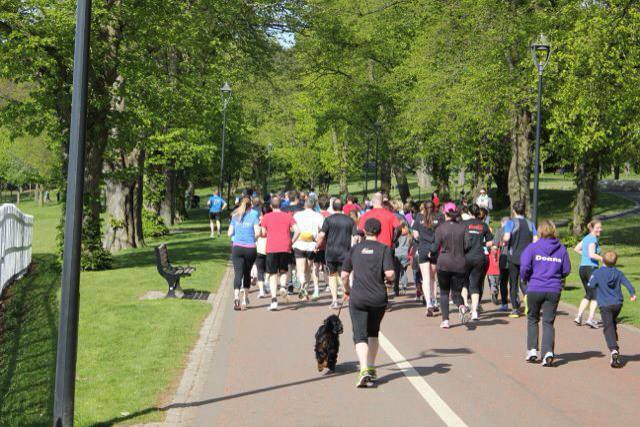 I was really keen to do well this week, as I’ll miss the next two Saturdays, and the one after that is scheduled to be the mass Jog Lisburn event. 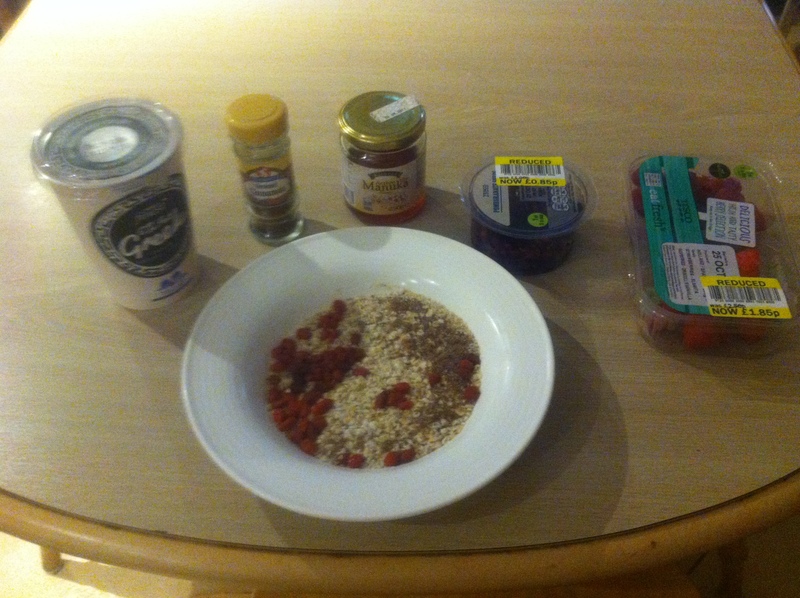 I got a good night’s sleep (though I still get a real adrenalin rush of nerves before an important run), and had a superfood breakfast of Berry Bircher. 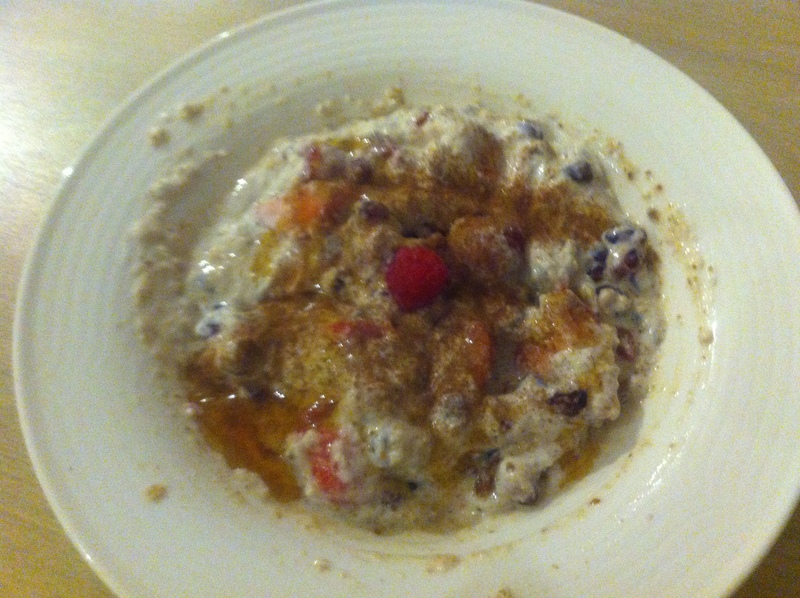 That’s overnight oats with flaxseed, goji berries, raspberries, strawberries, pomegranate seeds, cinnamon and manuka honey. Yummy carbohydrates! The weather forecast had been ominous, with yellow warnings of rain and strong winds, but it turned out to be dry, cold, and just a bit breezy. I had no excuses. I did my warm-up lap, and my stretches, peeled off my outer jacket, wrapped my headband under the iPhone holder so it wouldn’t be slipping down my arm, selected my jogging playlist, waited for the whistle…..and pressed START. I’d worried that the frequency of the voice-in-my-ear I’d chosen would be too much, but actually it was just about right. It’s obviously relying on a GPS fix for distance and hence speed, so these aren’t error-free, but the elapsed time is bang on, and I knew I was aiming for a 6 minute first (short) lap, and 7 minutes for the 3 longer laps. To acheive a new PB, I’d need an average pace of under 5:36. I flung myself down the hills, remembered to keep my knees up, stretched my stride, glided in between each footfall, and didn’t fight the hills. The marshalls, many of whom are fellow Jog Lisburners, cheered me on at every corner. About half way through the last lap, I knew I was going to do it, and do it well. Knowledge is power. I sprinted up to the finish line and crossed it in 27:25. One of the great things about ParkRun is all the statistics that it holds. This brilliant PB moved me from #499 to #465 in the Best 500 Times table, and from 245 to 202 on the age graded table. Best of all, I’m number one on the female points table! You want to see the mile-wide smile on my face……..
Friday dawned. 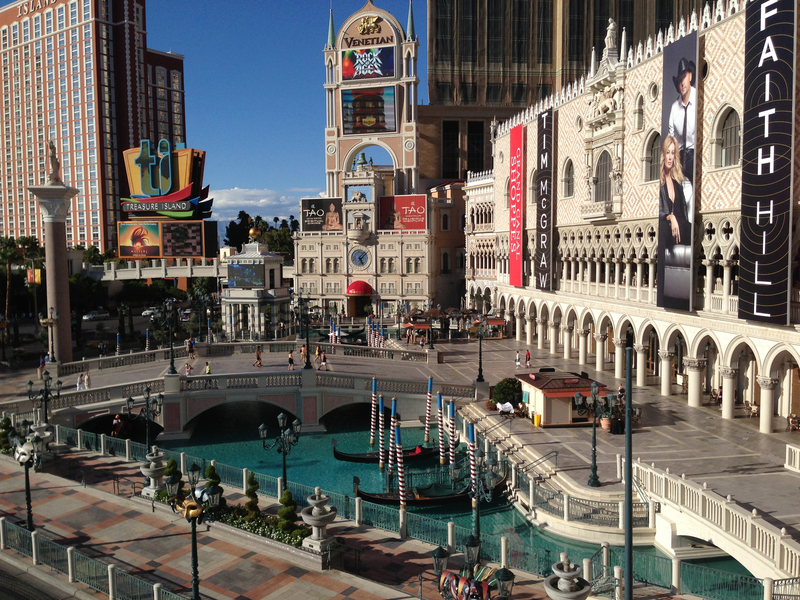 I ran off my hangover in the gym, and we set off for an aimless wander of the Strip. Having missed out on his Man vs Food dinner last night, R was heading for Hashouse a Gogo in The Quad, which had featured on that TV show a while back. 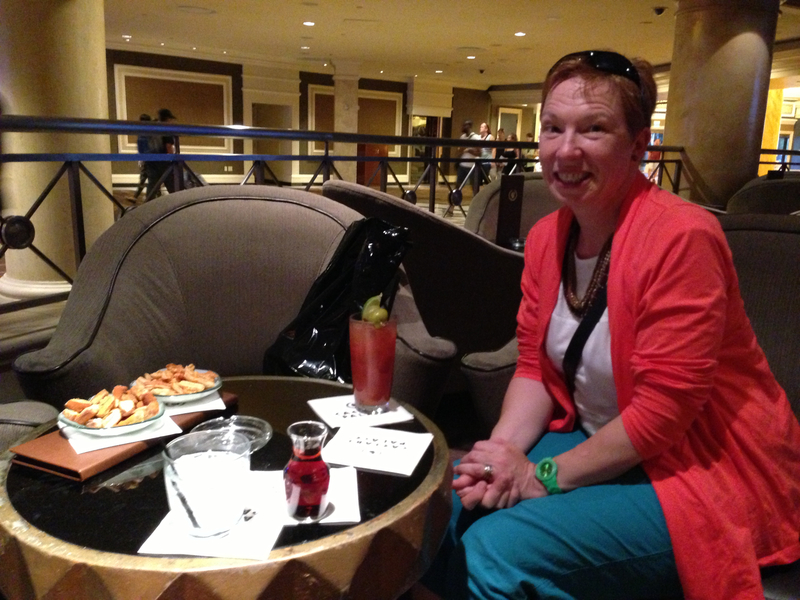 There was a bit of a queue, but the restaurant had a pop-up bar in the waiting area serving the best Bloody Marys on the Strip, complete with jalapeno stuffed olives. R enjoyed a Tangerine Screwdriver while we admired the array of signed photographs from famous visitors. After lunch we aimlessly wandered through Miracle Mile shops, which features an indoor rainstorm, and its own dancing fountains. Back at our hotel we fancied another go at Pai Gow, but the table limits had increased to $25 minimum bet, which was too high for my tastes. Labor Day weekend was approaching, the queues at check-in were longer, guests were wandering around with jugs of cocktails on lanyards round their necks, and the minimum bets at all the tables were creeping skyward. We headed for Freemont Street, the old downtown Vegas, home to the original casinos like the Golden Nugget, with live music and an amazing ceiling of lights which danced and dazzled. To get there we took the Deuce bus. 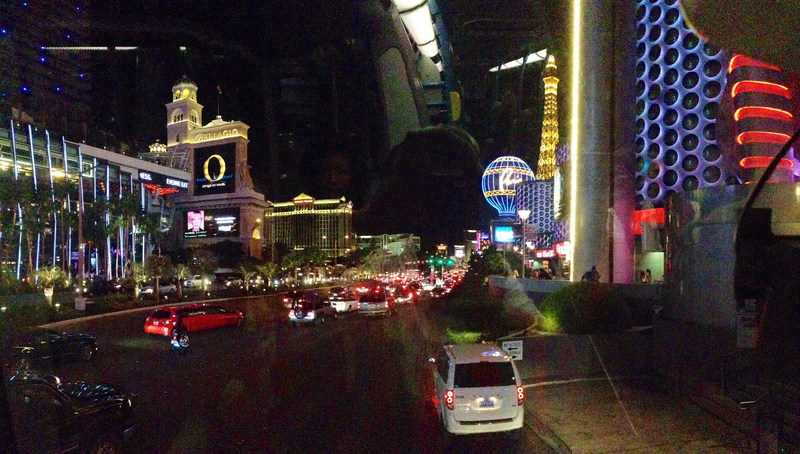 This is a double decker bus which plies the strip, stopping at most major hotels. In the heavy evening traffic, it makes slow progress, but at $8 for a 24 hour ticket, it’s great value, and if you can find a seat near the front upstairs you’ll get some spectacular views of the famous brightly lit hotels. 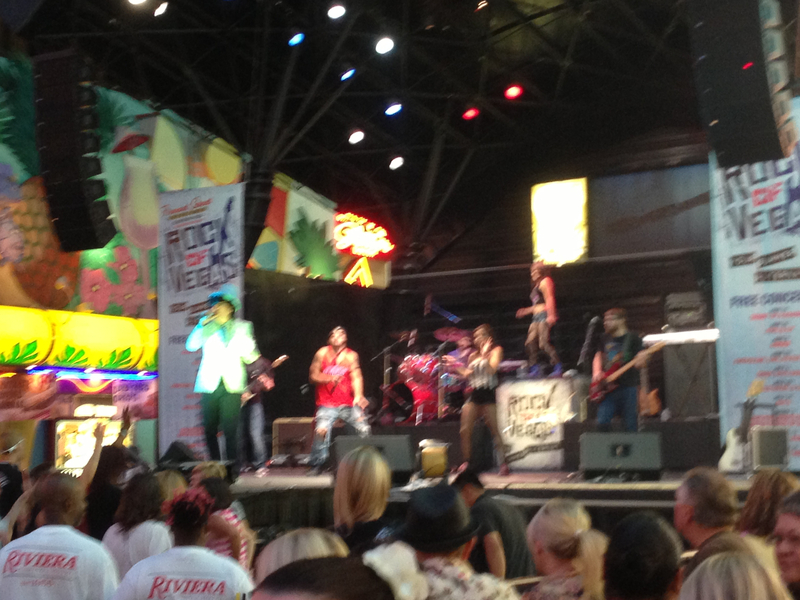 Freemont Street is like Blackpool on speed. We were able to get some drinks in plastic glasses and wander about soaking up the atmosphere, enjoying the live music and a stunning light-roof. 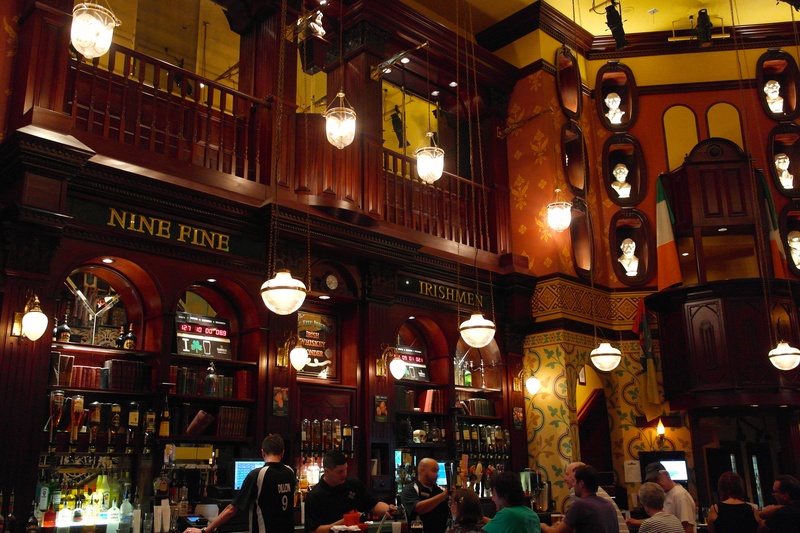 In the Golden Nugget, we shared a plate of nachos, before finding a bar with an Elvis impersonator who claimed to have a song for everyone. When he learned we were from Ireland he played something by U2. I danced with a couple of other game girls, R went to the loo and got lost, so we took a taxi home. There is a different bus called the Strip and Downtown Express or SDX, which uses the same ticket as the Deuce. 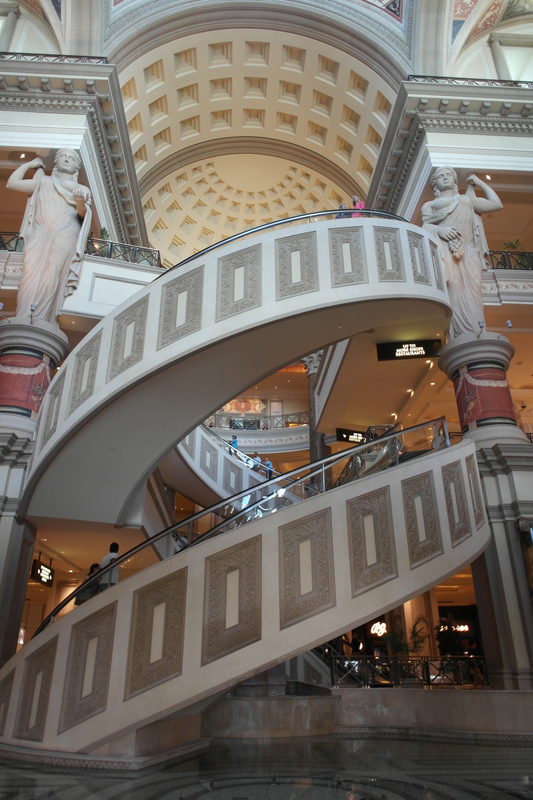 It is a single decker, doesn’t have so many stops on the Strip, and goes all the way out to the Premier Outlet Mall. This takes you past some of the less glamorous areas of Vegas. Small single storey buildings separated by vacant lots sport signs which indicate the trouble that many people get into in this city: Bad Boys Bail Bonds, pawn brokers, garages offering to give you cash for any vehicle, and plenty of attorneys. The outlet mall is mostly outdoors, but has a good range of shops offering decent discounts, and an OK food court. 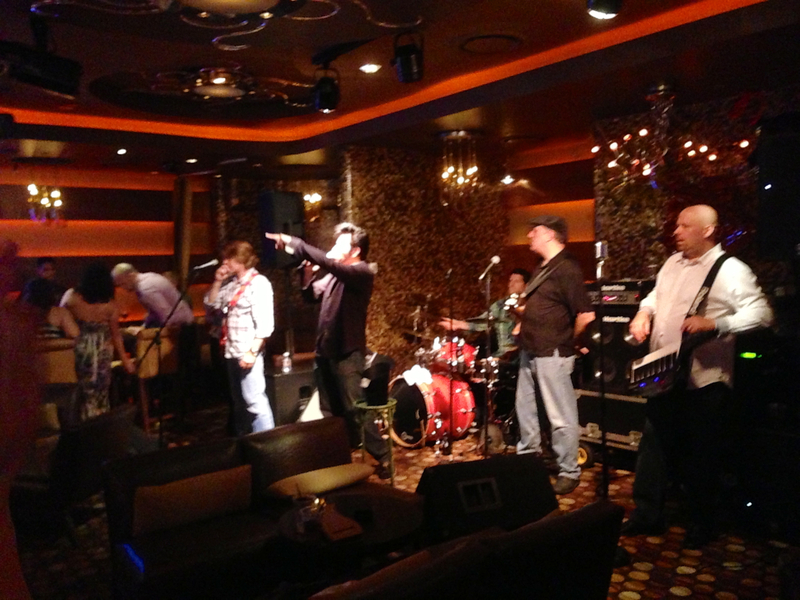 Saturday was our final night in Vegas. We took the Deuce back up to Miracle Mile shops, as R decided he quite fancied a leather Stetson we’d seen in Hattitude, and I’d offered to buy him that as a birthday present. 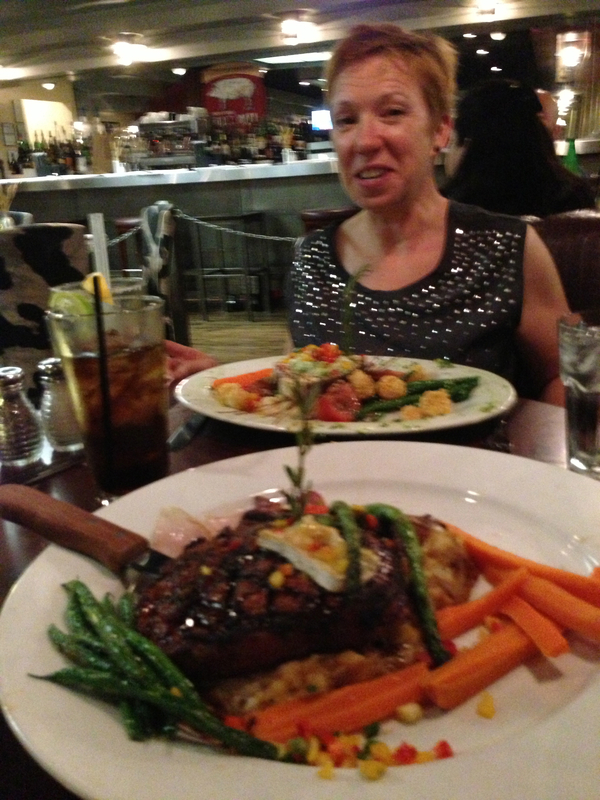 And for our final meal, we’d booked a table back at Hashouse a Gogo where he devoured an 18 ounce rib eye, and I tucked into grilled swordfish. 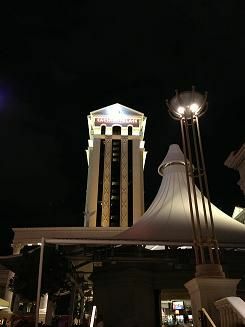 Across the Strip, we tried to find a good viewing spot for the Bellagio fountains, but found ourselves lost in the sumptuous surroundings of the hotel itself. R bumped into TV baker Paul Holywood in the loos, and I counted six stretch limos parked outside. The fountains were beautiful, the show is repeated every 15 minutes to different music, and as it’s free it is a popular attraction. We bought another 24 hour pass for the bus, as we planned to return to the outlet mall in the morning, and back at the hotel I put $20 into the Wheel of Fortune, comped a few drinks, and took out $14 after an hour, which I reckoned wasn’t bad going. 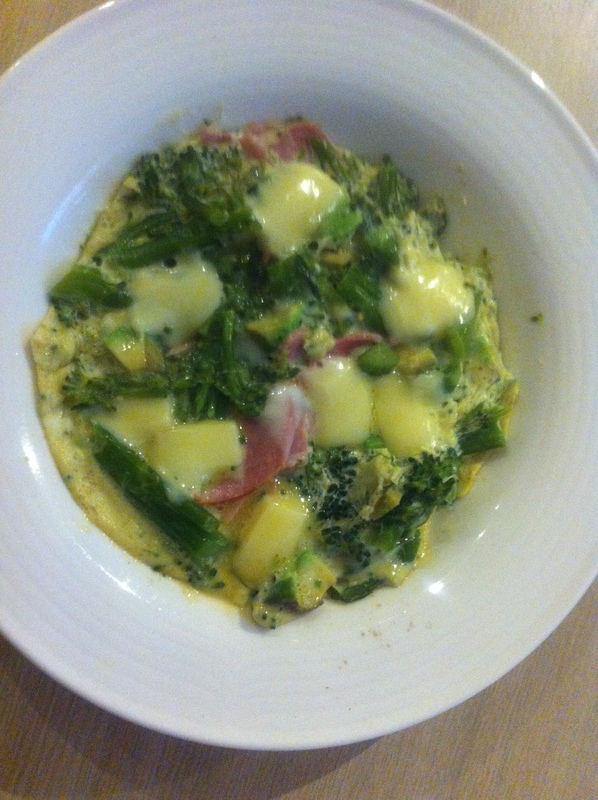 Eggs are a key part of my 5:2 meals. At only 70 calories each, with egg white even less, their versatility and ease of cooking make them a must-have staple in my kitchen. I made this scramble on a non-fast day, but it would work well on fast days too. The cheese and avocado can be omitted for even fewer calories. Total: Approx 300 calories and 30g protein. Low carb. Chop the brocoli into bite-sized pieces and place in a microwave bowl. Blast for 30 seconds to warm it through. In the same bowl add in the chopped avocado, and the ham, torn or cut into small pieces. Break an egg and 2 egg whites into the bowl, and mix well. Add some black pepper to taste. Cook in the microwave for 1 minute, keeping an eye on it and stirring if needed. Check that it’s solidifying nicely, but not too much. Dot the cheese in thin slivers over the top, and microwave for a further 30 seconds to melt the cheese. Spinach would work well in this too, and keep the “green eggs” theme. On Thursday morning we thought we’d better learn a bit more about gambling. 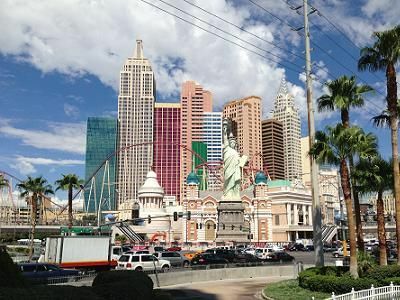 It goes without saying that this is where Vegas makes its money, but it was somewhat shocking to comprehend just how much this is – the city makes so much money from gambling that it doesn’t need to charge any additional city taxes. This makes it quite an attractive place to retire to. Rooms in the casino hotels are cheap, because they want you in there gambling. Drinks are free while you’re playing, as the drunker you are, the more you lose. The croupiers are all very pleasant and helpful, and make the experience fun. 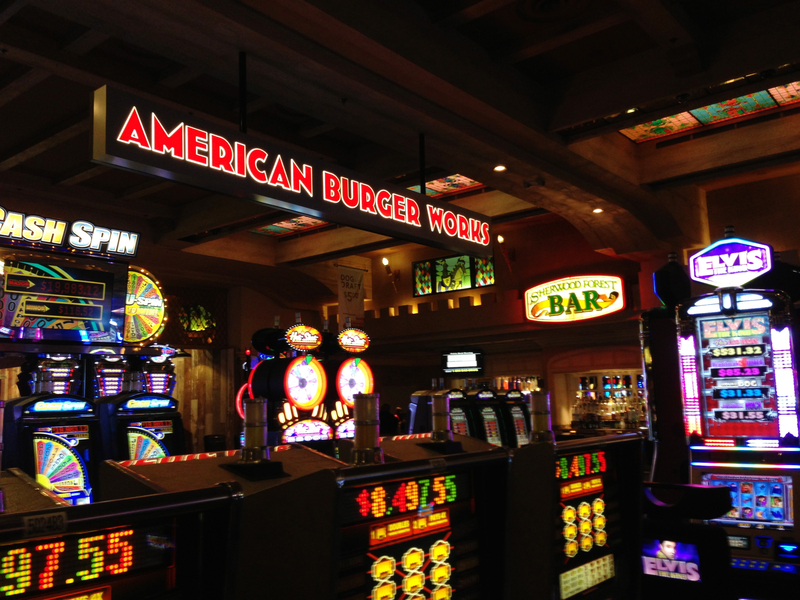 Each morning, there are free lessons on the main table games – roulette, blackjack, and craps. But my moral compass struggled somewhat with the billions being made off what is basically people’s stupidity. The house ALWAYS wins. We started with roulette, a game I’ve never really played before. The premise is simple – you pick a number that you think the ball will land on. Or you can pick several numbers. Or groups of numbers. Will it be a red number, or a black? Even or odd? Low or high? The lesson gave me enough knowledge to feel confident about what to do, but I still wasn’t drawn to it as there’s no real skill involved on the player’s part. The next lesson was in Blackjack, and here I really did pay attention. I knew there was a strategy table that advised when to split, double down, etc depending on what card the dealer was showing. Lady Luck still has her bit of fun, for sure, but playing this I felt you weren’t completely at her mercy, and the player can use a bit of maths and logic. To ask the dealer for another card, tap one finger on the table, while a wave of the hands over your cards means you dont want another. The final lesson was in craps, which is what you see people playing all the time in films (and Friends). The throwing a pair of dice up an enclosed rectangular table looks dramatic, but I’m afraid I didn’t quite understand the maths or the logic involved, so I resolved to keep that one as a “watch only”. The other game which was very definitely “watch only” was Poker. There are dedicated glass-walled zones in all the casinos for those who’ve been working on their poker-faces, and I was intrigued at the variety of people playing – old, young, black, white, male, female, it clearly had a universal appeal. But I wouldn’t be nearly good enough to participate, and anyway, my face is always a dead giveaway. I do understand poker hands, though, and on the recommendation of both Kevin our tour guide, and the blackjack croupier, we had a look at Pai Gow Poker, an Asian variation. Each person is dealt seven cards, from which they have to make two hands. The five-card hand should be the higher value one. Each player is only playing against the dealer, not the other players, so there can be lot of consulting and helping each other out, as long as the cards are kept over the table so they can be seen by the cameras in the event of a dispute. To win, BOTH your hands have to beat the dealers, and to lose, BOTH hands have to be worse. More often than not, one hand beats and the other loses, and so there is a “push” to the next round. This is indicated by a knock on the table with the knuckles. Most importantly, your bet stays on the table. That’s the basic rules of play. There are some added features: the dealer uses 3 dice in a bell to decide the order of dealing the cards, and there is a “fortune” bet beside the main bet. The fortune bet looks at all 7 cards displayed by a player, and pays out on any winning combinations such as full house, run, straight etc. If the player puts above a certain amount as his fortune bet (eg $5), then he qualifies for an “envy” bonus, which means that a winning fortune payout to one player is also paid out to all those holding an envy mark. After our gambling lesson, we explored the hotel’s pool area, which was pleasant, but not very exciting. The weather wasn’t sunny, but it was dry, so we went back to NYNY so that I could ride the roller coaster. It cost $14, was a fun ride, and don’t forget your ID when you’re paying by credit card! We’d planned to go to Freemont Street that night, and R was saving himself for a heart attack burger, a concept in such bad taste it could only happen in Vegas. Diners have to wear a hospital gown to eat the calorie-mountain, gut-busting, artery-clogging meals, and are spanked by a nurse-attired waitress if they don’t finish it. Those weighting over 350 pounds eat for free. We explored the eateries in the fake New York streets for something light to eat. I had a salmon burger, and he a small Caesar salad which came with very strange textured croutons. We went back to our hotel aiming to have an afternoon nap, but played the Wheel of Fortune for a while, before deciding to give Pai Gow poker a try. Three hours later we’d had far too many free drinks to be going anywhere else, and I sensibly cashed in my chips and went to bed. As I’ve said, R likes to do “aimless wandering”, but I am not going to travel half way round the world without checking out some of the Must-Sees. The Grand Canyon had been on my list for many a year, and I’d pored over reviewers comments on Trip Advisor of the various means of seeing this wonder. 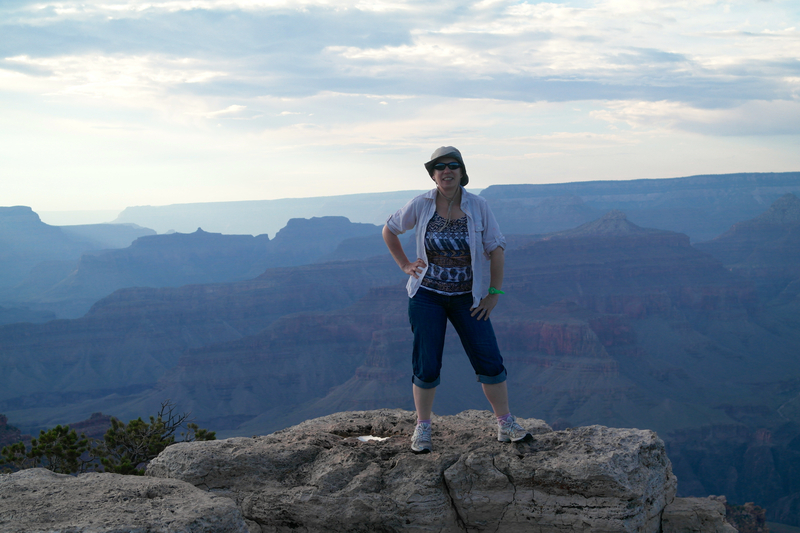 Soon after we’d bought out vegas tickets, I booked a sunset tour to the South rim with a smallish group, run by Grand Adventures. On the morning of our tour, I breakfasted on tea and a banana from the Starbucks kiosk beside the Rotunda, a circular area at the back of the hotel from where all tour groups and shuttle buses operate. We watched many of the large air-conditioned coaches arrive, collect their passengers, and leave again, and I was relieved when at 9 a.m on the dot Kevin arrived in the Grand Adventures minibus, and greeted us warmly. 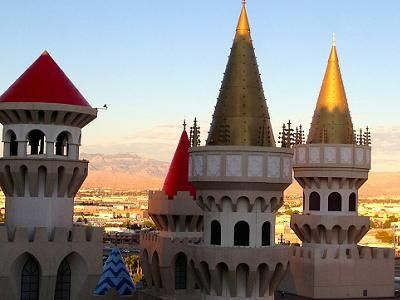 After pick-ups at Luxor, Tropicana and Vdara, our party of 9 was complete, and we set off through the Vegas outskirts, Kevin giving us a running commentary on the history of the city and the various landmarks we passed, such as the Heart Attack Burger Bar, David Copperfield’s villa. We soon reached the Mohave Desert, and our first stop was at McDonalds in Boulder City for breakfast, or in my case, second breakfast. It was such a change to be looking out at dry pinkish scrubland, and the heat outdoors was intense. Our next stop was Hoover Dam (originally Boulder Dam) and en route we passed a mansion that had belonged to Nicholas Cage, before he lost it during bankruptcy proceedings. Lake Mead, formed by the dam, has been showing record low levels, and the white chalky “bath tub ring” reveals just how much the water has dropped. Depending on whether you believe the climate change doomsayers or not, the future viability of the dam itself is in doubt. The dam was built across the Colorado River, which forms the border between Nevada and Arizona. These states operate Pacific Time and Mountain Time, so there’s usually a one-hour time difference which you can observe changing on your watch or phone as you cross the dam. On our visit, though, daylight savings time was in force, so the times shown by the clocks on the towers at either end of the dam were identical. One of the interesting facts I learned here was that the hard hat was invented during the construction of this major engineering project. It was hot. Dam hot. Back on the bus, we continued across the vast desertscape to the crossroads town of Kingman, with its many gas stations, the price falling the further towards the centre of town you got. We had a fuel and restroom stop here, and picked up some of our favourite peanut butter crackers to while away the journey. 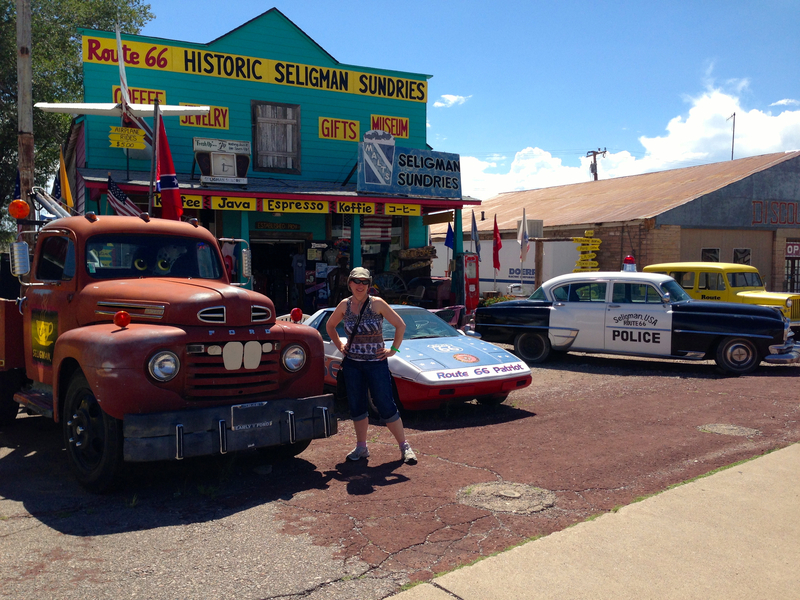 Next stop was Seligman, on historic Route 66. This iconic road ceased to be maintained in 1985, but sections of it are still kept alive by local campaigners and supporters of the Mother Road. The first of these sections to be adopted was here at Seligman, where vehicles parked at the side of the road which had been given humorous eyes and features inspired the movie Cars. I could happily have stayed here much longer than the mere half hour we had. I like to buy jewellery when I travel, and I really would have loved some turquoise. 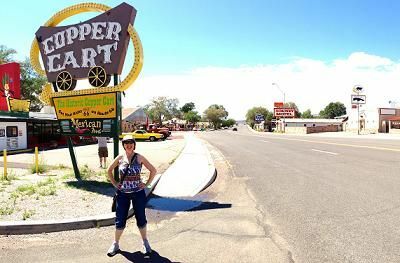 It gets its blue colour from the nearby copper mines, but was a bit pricey for my traveller’s budget, so I settled for a chunky brown stone necklace at the Road Runner cafe, and posed for photos beside the famous road signs, and the original Tow Mater truck. The next part of the journey was long and rather tedious. The landscape was flat and dull, I found myself wondering how on earth a canyon could be near here as I could see no mountains! Worryingly, we also hit a few rain-showers, but seemed to pass through them and finally reached the Grand Canyon National Park. The name Grand comes from the fact that the river used to be the Grand Colorado River. We called at the El Tovar Hotel, again another place full of character and history which I’d loved to have lingered longer in, but time was ticking by. 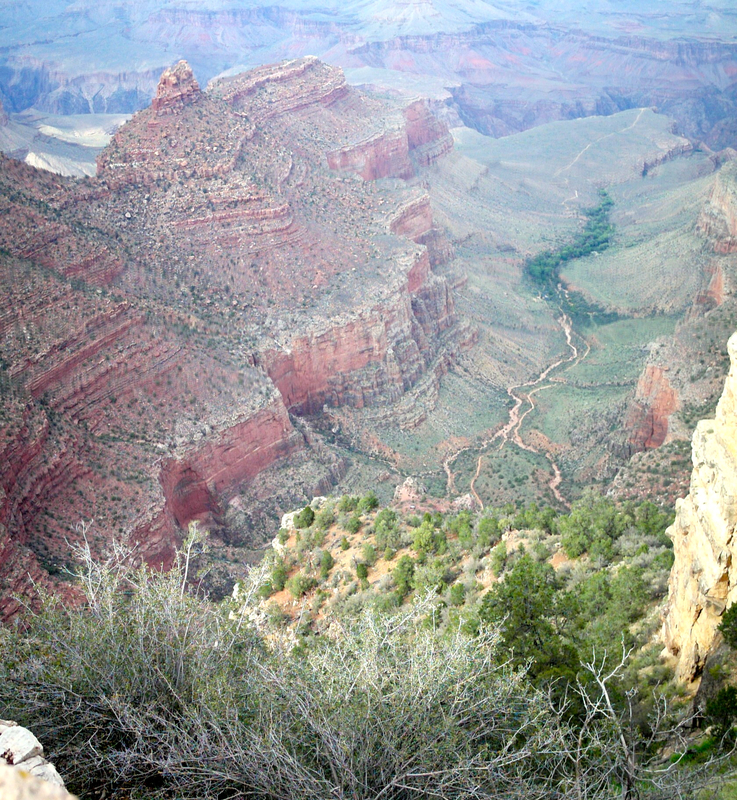 It is just about impossible to describe that first glimpse of the canyon itself. It is vast, stretching out as far as the eye can see, and seeming to defy logic. The Colorado River is a barely visible brown tickle, and it is not advisable to try to hike down to the bottom and back up again in one day. The North rim over there is 11 miles away as the vulture flies, and we saw more than a few of those circling lazily overhead as we ate our picnic lunch, carried to our site by Kevin. This comprised were well-stuffed sandwiches, cheese and crackers, grapes, and cookies. We strolled among the Ponderosa and Juniper pines, Kevin pointing out interesting wildlife and rock features as we went. There were plenty of photo opportunities, even jokey ones like the fake “help, I’ve fallen off the edge!” ones. The edge is not sheer, so there’s often a series of ledges behind what appears to be a precarious rim. 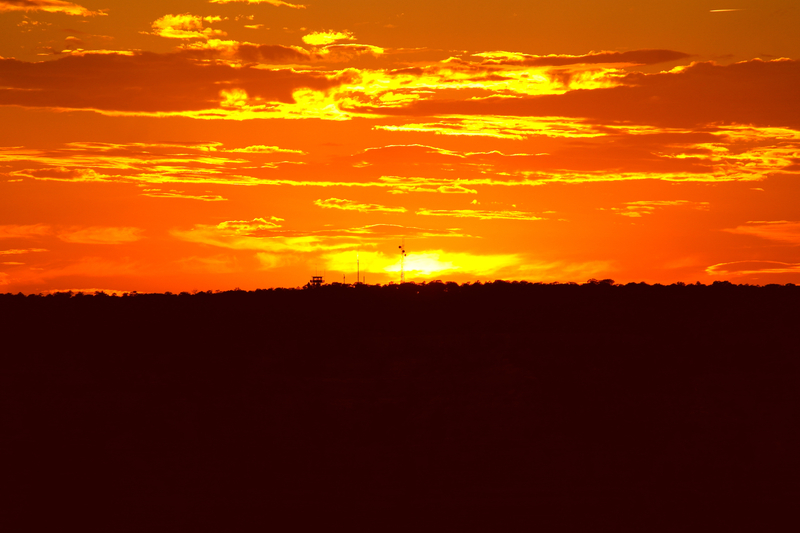 The sunset itself was glorious, turning the canyon pinky brown, and the sky above a fiery orange. The journey home was long, as we expected. It was dark so there wasn’t much to see (though I occasionally glimpsed some tantalisingly clear starry skies), and we caught up on some sleep before reaching the hotel at midnight. My former English teacher used to implore us not to use that old “tired but happy” cliche, so instead I’ll say we were exhausted but elated. of a reversed L shape, the main vertical bit being the Strip proper. know, I’m far too sensible and logical to make a good gambler. machines on the bar counter in front of you. was a beautiful sushi roll filled with avocado and prawn. at the back of the MGM Grand. playing on a giant screen above the reception desk. clocking in at the number 10 spot. Linq, an attraction due to open next year. Coconut, close enough!) but this place had the odour of stale wee. experience which did double duty as brunch. I don’t know where I’ll wear them, but when in Rome…. drinks pushed this up a bit. for volunteers to sit in the co-pilot’s seat, and R’s hand shot up. 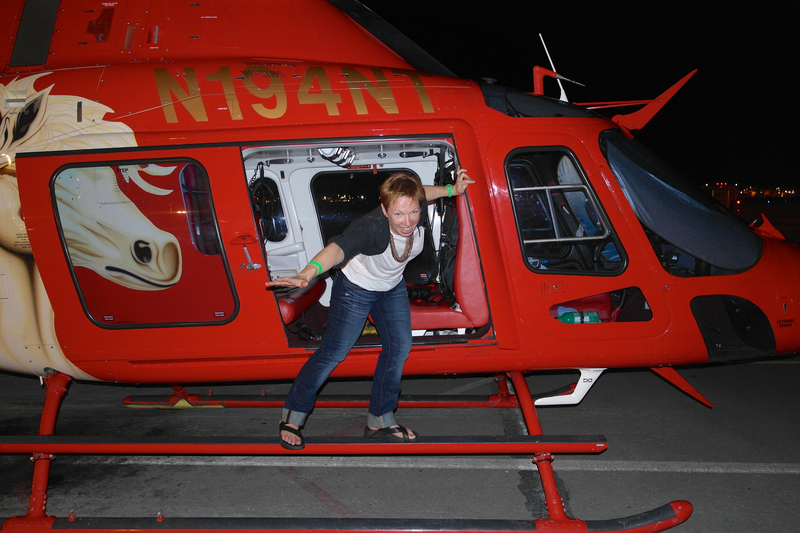 minutes to pose for photos at a chopper on the ground. the seats beside the windows on the left hand side. early night ready for tomorrow’s adventure – the Grand Canyon!